<1>Wall Décor: a great addition to your wall with this modern style wall decoration plants holder. <2>watering reserve: to fill the vertical wall plants container pot with water and then lasts for days without any further attention. <3>Vertical Garden: a DIY vertical garden can be compact enough to fit most spaces, and you can grow several types of delicious greens in this small herbs holders. <4>Kitchen Decorative & Herbs Gardening: you could be planting and harvesting fresh vegetables very easily without the need for expensive system or professional skills. It's a great addition to your kitchen. <5>Applicable Places: garden, home, office, kitchen, porch, family gardening decoration, planting or anywhere else in or around your home is a breeze; for planting strawberries, vegetables, foliage plants, hanging plants ect. INDOOR & OUTDOOR USE: vertical wall hanging planter made of high quality durable PP resin material, safe and non-toxic, this polypropylene resin planter is a tough, lightweight , all-weather durability with UV protection for outdoor use, an alternative to clay or ceramic planters. Pull out drainage plug to allow for the removal of excess rainwater when installed outdoors. Install drainage plug when used indoors. SIZE (L*W*H): 9.6"x5.7"x8.3"; 4 x "S" hooks of stainless steel included. PLANTER WITH DRAINAGE MESH & WATER RESERVIOR: hanging planter pots with drainage mesh to allow excess water to store in the bottom of this lazy flower pot and provide to your plants as needed to ensure plants take enough water they need for days, and you don't have to water them frequently. This clever hanging flower pots may help you care your plants when you go outside a couple days or on business. EASY CARE & KITCHEN HERBS PLANTER: kitchen garden pots inner drainage mesh is removable-enable you to change or move the plants easily. Kitchen living herbs planter holder helps you plant fresh delicious vegetables easily, such as basil, chives, cilantro, lavender, lemon balm, oregano, parsley, peppermint, rosemary, sage, tarragon, thyme, lettuce, rocket salad, cress, spinach and mustard. No fears of dripping, in easy reach when you're cooking and want to add a bit of fresh herbs. 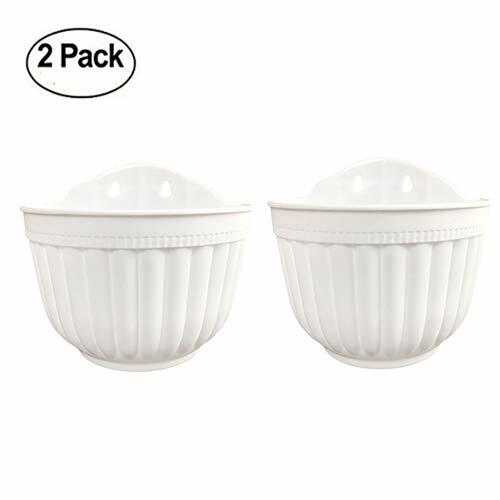 WALL DECOR & 90-DAYS WARRANTY: wall decor planter pots holder with polishing processing modern design, sleek clear white, fancy slick surface, attractive looking, simple and artistic, will nicely compliment your home, office, kitchen, garden, lawn and patio. Replacement for this vertical living wall planter, repaired parts for wall mounted indoor outdoor hanging flower pots, or refund for lazy flowerpot, wall hang / window boxes, shall be covered within the warranty period. VERTICAL HANGING PLANTER & VERTICAL GARDEN POTS: wall mount planter pot with 2 hanging holes for vertical hanging plants, a perfect blend with the wall. You could use a command hooks or suction cups or 2 nails to hang plants onto the wall or window glass. If you have a sunny wall, this small vertical wall container is perfect for your DIY wall vertical garden. African violent, succulents, cactus, orchids, kalanchoe, morning glory vines and Haworthia, choose the varieties of greens you like best. If you have any questions about this product by Orimerc, contact us by completing and submitting the form below. If you are looking for a specif part number, please include it with your message.